Cranberry Sunshine Salad with Honey Lime Vinaigrette is my new favorite summer salad. 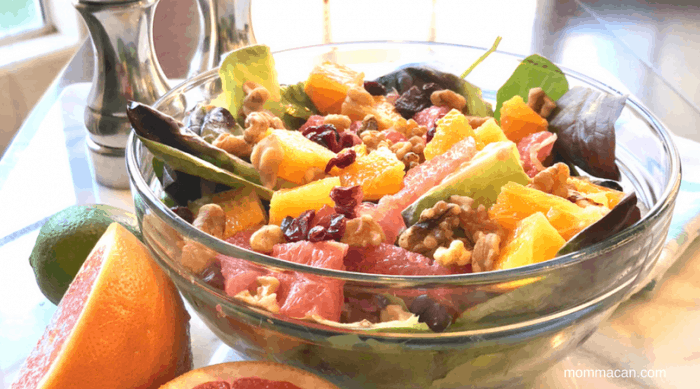 I started making this fresh citrus salad quite by accident. We recently began receiving a fresh fruit and vegetable box each week from Farm Fresh To You. 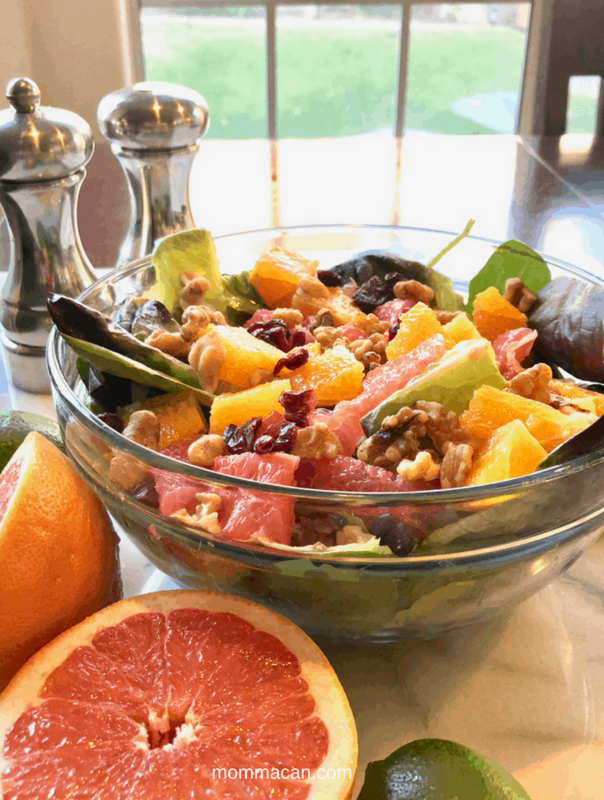 I ended up with a surplus of grapefruits and oranges and decided it would look beautiful in a salad. 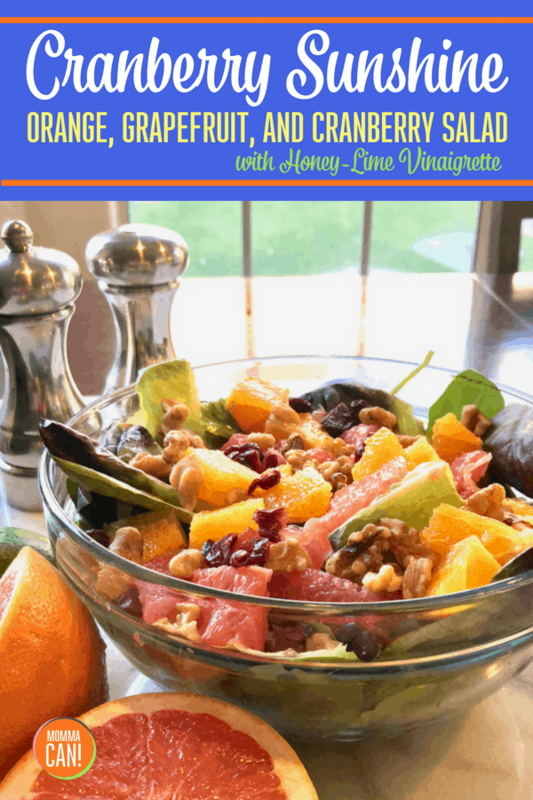 Adding crunchy walnuts and tangy dried cranberries took this salad right to the top of my favorites list! The honey lime vinaigrette adds just the right touch of sweet to the lettuces greens and compliments the citrus fruits. Making the salad was a breeze using a good chef knife and peeling the rind away from the fruits. Then just cut them in half and then quarter the halves. I removed seeds with the tip of my knife, but the only fruit with a few seeds was the grapefruit! You can use your fingers to get those seeds out, it is totally fine! Serve this salad alongside grilled meats and fish, and you have the perfect summer dinner! I also enjoy adding sliced avocado if I have a ripe one on hand. 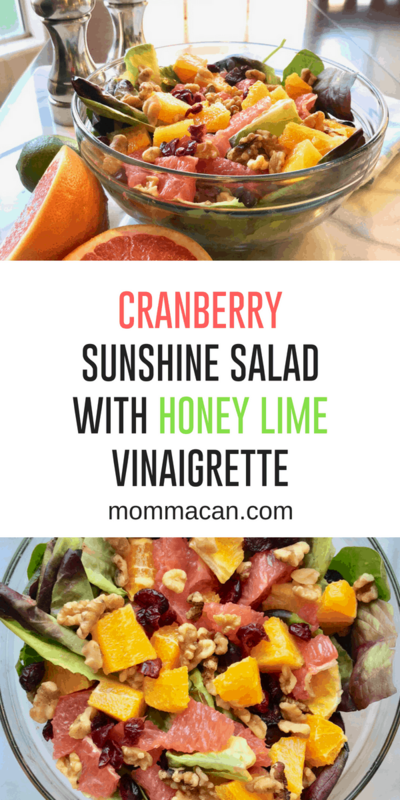 I can’t tell you how much we have enjoyed making this Cranberry Sunshine Salad with Honey Lime Vinaigrette and creating other recipes with the Farm Fresh To You box. The fruit and vegetable box delivered each week has made creating new recipes so much fun. Delicious and fresh Cranberry Sunshine Salad with Honey Lime Vinaigrette! The perfect summer salad. 1 grapefruit seeded and cut into eighths. 2 navel oranges peeled and cut into eighths. 2 seedless tangerines, peeled and cut into quarters. 1/4 to 1/2 cup walnuts whole or pieces your choice! Honey Lime Dressing: Whisk together honey, lime, and salt. Add olive oil and whisk until blended. 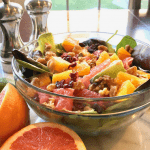 Arrange lettuces and citrus fruits into a large salad bowl or divide into 4 individual bowls. Drizzle dressing on to greens. Sprinkle on cranberries and walnuts. Serve immediately. I love to add avocado and even grapes or strawberries to this fresh salad. 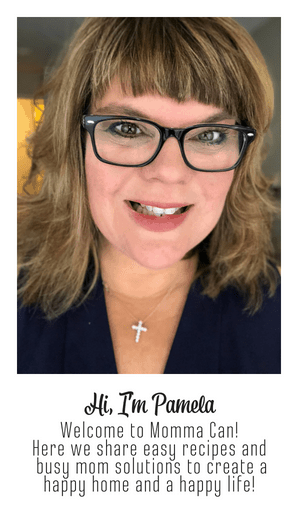 This looks so good Pam, I need to make it with the slow cooker chicken recipe you shared. Yum.